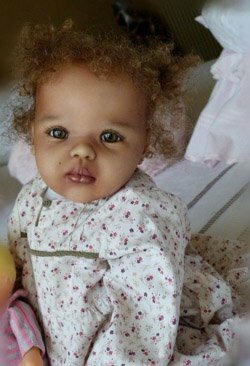 Dorie Gilliam has become the unintended face of the Reborn Doll craze after she was interviewed by NBC’s Kerry Sanders. She spoke with Sanders about why she loved the dolls. Instead of being the creepy person some expected, Dorie was a pleasant women with 3 children of her own, and grandchildren too. She spoke about how the dolls helped to relieve stress by bringing back a simpler version of a happy time in life. Reborns is run by Dave Stack, who originated the idea for the dolls. He also runs the web site Bear Pile. He admits that a lot of people, especially men, may not see the value of these dolls. For many women it can be a chance to re-experience one of the happiest times in their lives. The dolls are crafted to present as many different styles as possible. 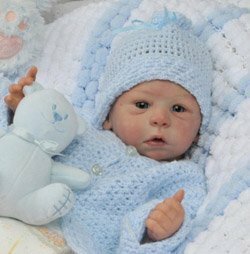 The detail and care put into the creation of realistic reborn dolls perfectly captures the newborn appeal. From the tiny fingers and toes to the delicate lashes and faint blush – these dolls are a 3 dimensional portrait of the beauty and adorableness of a sleeping newborn. 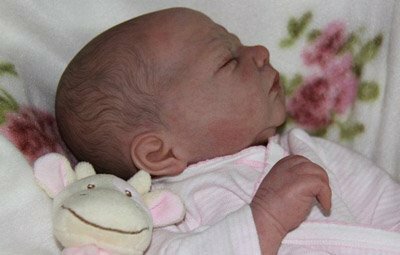 There are very few people that would consider the newborn creepy, and Reborn Dolls are cuter than you can imagine. This isn’t a Cabbage Patch Kid, these are lovingly crafted replica dolls. Gilliam and her husband both admit that the Reborn Dolls may be aimed at women only because men may not get their appeal. That isn’t a stereotype, but most men don’t provide the primary contact and care for newborns. It makes sense that the association of love and happiness with this age would be mostly a woman’s thing. That isn’t to say that some men won’t take to them too, but chances are most won’t have had the experience of caring for a newborn in the way that makes these dolls just perfect. Dorie Gilliam may be more on target than you think with saying that holding the dolls helps relieve stress. It is a common practice to use baby dolls to calm and soothe elderly residents in nursing homes. The act of holding and caring can trigger emotions or hormones that help to soothe the body. It’s a plus that these dolls are so realistic – except in one category. These dolls don’t cry, wet themselves or need constant attention.